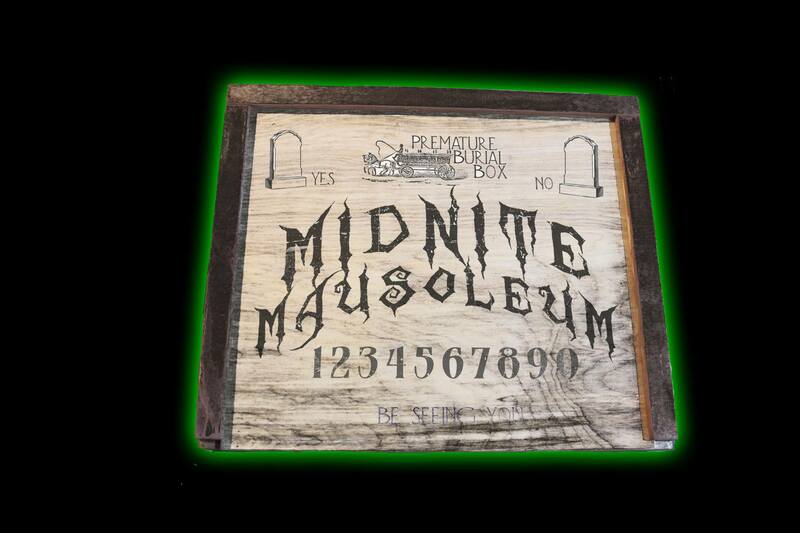 THE ULTIMATE MIDNITE MAUSOLEUM COLLECTIBLES ARE NOW HERE! 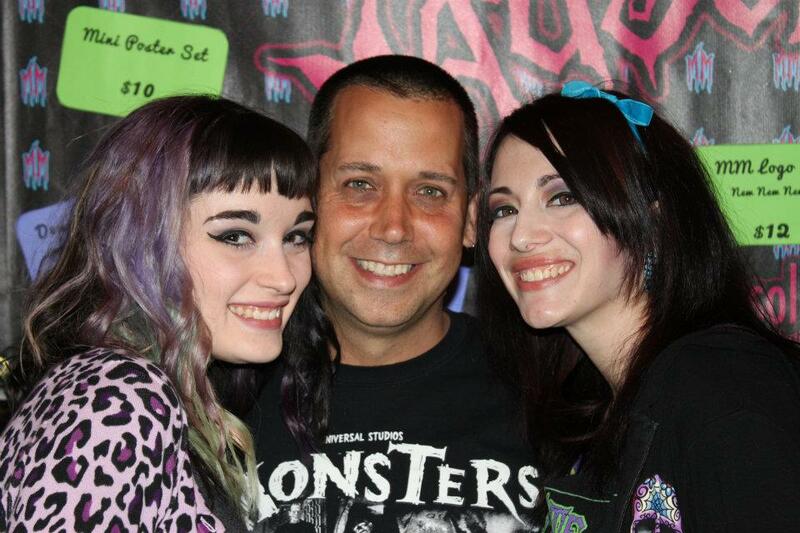 The Daves have always been fans of horror hosts. In fact it was our mutual love of Svengoolie that not only brought us together as friends but brought about this very site. The show Midnite Mausoleum, starring Marlena Midnite and Robyn Graves, have always been one of our favorites and we are proud to announce the ultimate Midnite Mausoleum DVD collections! 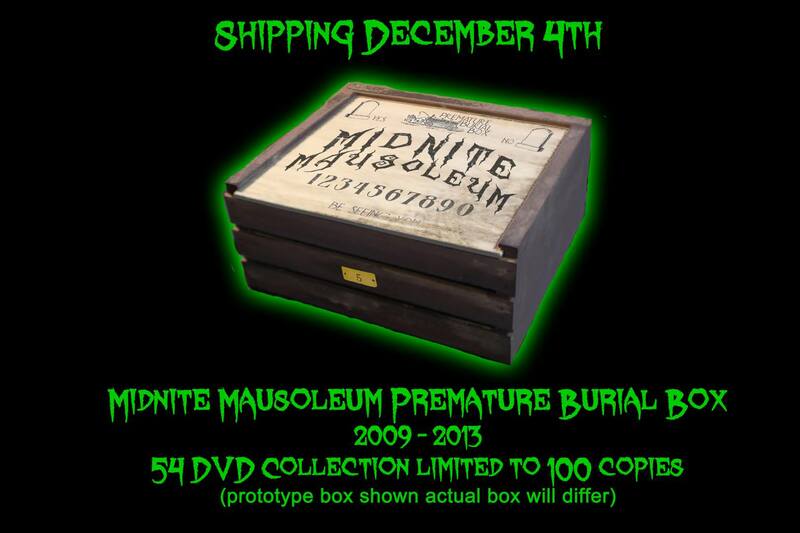 The Midnite Mausoleum Premature Burial Box 54 Disc Boxed Set is available for pre-order and will begin shipping on December 4th. It is the ultimate collection and will be limited to 100 sets. This set includes every public access episode from 2009-2013 as well as all 47 television episodes (season 2 through season 6) as well as the first 12 web only mini episodes (season 1). Also included is an extended PHILADELPHIA edition of the first television episode (#13) as well as both 2010 SUMMER CAMP specials featuring Thomas Berdinski’s ITALIAN ZOMBIE MOVIES 1 and 2. This set is topped off with a special disc with footage from February 2009 featuring construction of the Mausoleum set, Marlena’s puppet building and test shoots for lighting, characters and wardrobe… only available here! And that’s not all! You will also receive an original “brick” from the original Mausoleum set AND an original 2010 trading card set. All of this will be housed in a limited and numbered custom Handmade “CRATE” with an INCREDIBLY cool lid! You can pre-order your own set by going HERE!!! 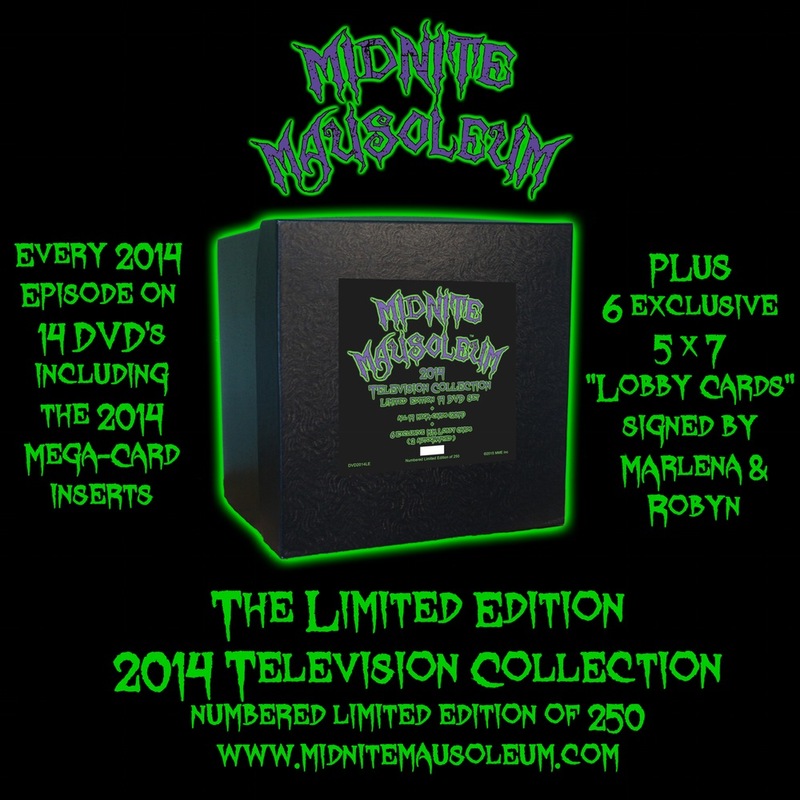 Also available for pre-order and shipping on October 26th is this limited edition of 250 DVD box set containing every 2014 television episode of MIDNITE MAUSOLEUM! Join Marlena Midnite and her friends Robyn, Wolfred, Franklin, Bones and Creepy Charlie as they re-launch Midnite Mausoleum via Broadcast Television! This set includes 14 full episodes as they aired on television, including The Bat, Rattlers , The Terror, They Came From Beyond Space, Nightmare Castle, Monster From a Prehistoric Planet, Santa Claus Conquers The Martians and many more! Also included is the 2014 BEST OF EPISODE, all 14 “Mega Cards” only available with the 2014 DVD’s and 6 exclusive 5 x 7 “Lobby Cards” (2 signed by Marlena and Robyn) only available with this collection. This entry was posted in Creepy Collectibles, Horror Hosts, Television Horror and tagged Marlena Midnite, MIDNITE MAUSOLEUM, Premature Burial Box Set, Robyn Graves. Bookmark the permalink. ← A Mad Monster Party with Svengoolie!